I've seen both the Kline and the Williams get a fair airing, both at BJ's home and in gigs. He has said the Kline requires less regular string changing and has quite a singular tone, partly due to that (Sorry if I am paraphrasing, I personally agree. Kline's are stunning guitars). For extra hipster cred, you have to use a valve amp, preferably old, large and tweed with an alnico speaker. Yep. I don't know if it's tweed, but you've seen Eric Heywood's Vox AC-30, no doubt. He's the only steeler I know who's gone that route, but I like all that hair he has in his tone. 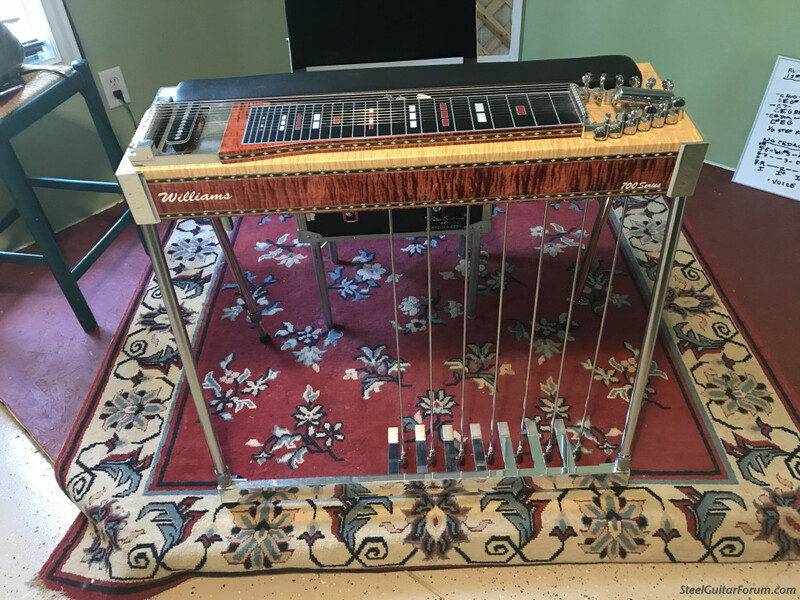 I read somewhere that Greg Liesz thinks the Fender Deluxe is the ultimate tone machine for pedal steel. Not enough headroom for most of his large gigs, but he said he likes them in the studio. He's been spotted with Twins and a big tweed Milkman Pedal Steel amp. George Redmon plays a beautiful Williams S-12 Keyless, lacquer Bordeaux, a wood neck, Extended C6th tuning, plays jazz, light rock, swing, pop and show tunes. Also uses several different tube amplifies including a gorgeous MESA Boogie, with different speaker cabinets and configurations which do include alnico speakers. However for health reasons, he plays mostly neodymium mag speakers these days. Believe me, hipsters, hippies, geeks, do play Williams. Which in my opinion is a good thing. I think I’m past the window for hip. I’m fortunate to own three outstanding U-12 s, each with it’s own charm. While I had a Williams S-10 for a while I couldn’t really make freinds with, the Uni I have now is a truly outstanding guitar in every way, and exceedingly lovely. I wouldn’t want to part with it. As for style, I do record and play a lot of stuff besides country, and it seems to fit everywhere. Can you post a pic of your Willy U12, and copedant? It sounds like you like it very much! Here ya go, Pete. Doing more session work with the Franklin currently, but every time I sit down to play this one, I’m comfortable and happy. At this point in my life I think I'm closer to Hip Surgery than Hipster but I love my Williams sd10 4 & 5 Metal neck Sustaaaaaaaaaaaane forever. At this point in my life I think I'm closer to Hip Surgery than Hipster.